SARATOGA SPRINGS, NY - I stopped by Shug McGaughey's barn at Saratoga Race Course Aug. 11 not to visit Point of Entry, but to take pictures of our old friend Hymn Book, the Donn Handicap (gr. 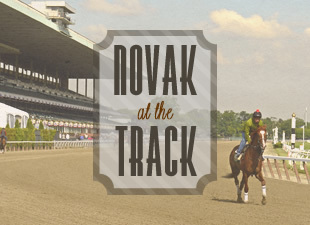 I) winner and subject of my first Novak at the Track blog. Hymn Book's stall is a few doors down from the Man o' War Stakes (gr. 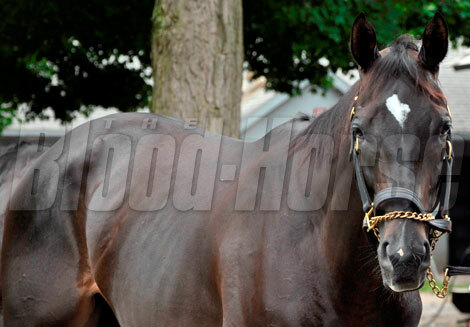 IT) winner, who starts this weekend in the Aug. 18 Sword Dancer Invitational (gr. IT) at the Spa. Point of Entry carries a three-race win streak going into the 1 1/2-mile Sword Dancer; he was an allowance winner at Keeneland April 14, grade II winner of the Elkhorn there April 27, then victor in the Man o' War July 14 at Belmont Park. Still, the bay colt faces speedy United Nations (gr. IT) winner Turbo Compressor from the barn of Todd Pletcher in the Sword Dancer, and will not get the same easy pace scenario he found to his benefit in the Man o' War when tracking second behind Center Divider before winging away to a 3 1/2-length victory. Winning this race would stamp him as possessing some pretty serious talent. Here are the entries. 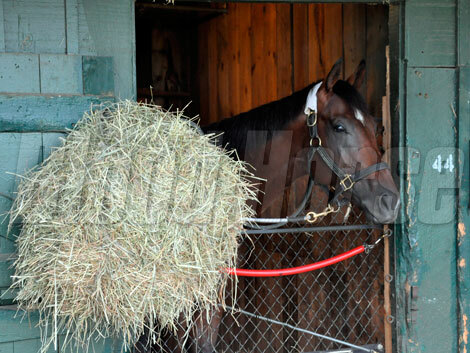 When I strolled down Hall of Famer McGaughey's shedrow, one of my favorites on the Saratoga backside since the old-school style and colors take you back to another era, Point of Entry's name caught my eye. The 4-year-old Dynaformer homebred out of the Seeking the Gold mare Matlacha Pass knew how to turn on the racehorse pose - eventually. But first he had to be bribed to come to the front of the stall, and then... well, you saw the photos. ...after Hymn Book, of course. For the Sword Dancer preview, click here.